How to spy on your competitors - without leaving your office! Our partners, GuestRevu have shared the following article about how to use online information to define and refine your competitive edge for 2017. The tourism trade contributed about US$7.2 trillion to the global economy in 2015, and with so much wealth at stake, you can be certain that the accommodation market is going to remain hugely competitive. 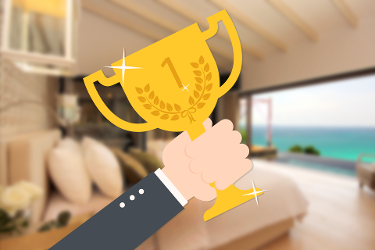 Unfortunately for hoteliers, differentiating your hotel from the competition can be pretty tough – essentially, you and your competitors are selling a place to sleep. Fortunately, though, your guests are buying much more than that – they are buying an experience. Differentiating yourself from your competition entails understanding the experience you are providing, and the experiences your competitors are providing, from the guest’s perspective. These days, social media and online reviews allow you to do exactly that. The festive season is an ideal time for hoteliers to keep an eye on what is being said about their own hotels, as well as their competitors’. The increased number of reviews allows patterns in feedback to be more easily discerned, the increased number of travellers allows you to see the hotels and your area from multiple perspectives, and the heavier workload means that any faults will be much more likely to come to the fore. Keeping an eye on what guests are saying online about you and your competition can help you discover what makes you unique, and therefore what you should be highlighting on your website, social media, online travel agent listings and other promotional material for 2017, and can help you make the changes to your operations that will help you differentiate your hotel from the competition next year. Closely reading online reviews of both your own establishment and your competitors’ hotels will show you what travellers loved and hated about their experiences, and what they think will matter to the other travellers who will be reading the reviews when they plan their trips. Social media provides a slightly different perspective, as guests often post during their stays (rather than once they get home, as in the case of reviews) and their posts are not necessarily composed with other travellers in mind, rather they are simply sharing their travel experiences in the moment. Anything that is mentioned frequently in reviews (or ignored frequently) can give you fodder for your marketing material (and may even give you some ideas for improving guests experiences). For example, if you notice that your competitors’ guests often mention the wonderful experiences they have had at particular nearby tourist attractions, you know that publicising your proximity to these attractions will make visitors more likely to consider your hotel. You can also use this information to create offerings that will help to differentiate your hotel from the competition – in the above example you could consider offering free transport to the most popular attractions, and, of course, publicising this offer. You can then use this information to derive themes, and spot areas where you can fill a gap and differentiate yourself from your competition, and determine where your competition has the upper hand. Keeping an eye on your online audience, and that of your competitors, will help you to gain a better understanding of your prospective guests likes and dislikes. If you can understand your target market well enough, you may be able to cater better to their desires than your competition. For instance, you could take note of the kinds of activities that travellers in your target market tend to enjoy, and put together special packages for next year that include these activities at discounted rates (you might also want to offer these packages exclusively to guests who book direct to help you curb spending on commission in 2017). The Umaid Bhawan Palace (which was voted the world's best hotel on TripAdvisor for 2016) is a functioning palace and is still the residential abode of royals. The hotel staff are the same staff that service the royal family, and a brief browse through the hotel's online reviews will show you that the guests notice this, that it permeates the palace and colours their experience if it. Other hotels, no matter how luxurious they are and how well trained their staff are, cannot imitate this. While your hotel might not be the seat of royalty, there will always be something that makes you unique. Keeping track of what guests mention frequently online can help you to see where your unique strengths lie. For example, your hotel might be situated closer than any of your competitor's hotels to one of the activities guests frequently mention online – make sure that people know about this. Your future guests are much more likely to believe what people similar to them tell them about your hotel than they are to believe what you tell them – use your past guests positive comments (or social proof) to highlight something that your hotel does better than your competitors. Of course, the more feedback you get the better, so employing a review collection system that automatically asks guests for feedback can help you greatly in determining what your guests are enjoying most, what really makes you stand out, and where you need to work harder. Many review collection systems also offer online reputation management features as well, which can help you keep track of reviews of your property from multiple sources, as well as help you to keep an eye on what's being said about your competition online.When pressed for time, as hoteliers almost always are, it can be tempting to only pay attention to reviews and mentions of your own hotel, but this will not help you to define your competitive edge. When you know what the competition is selling, you can be certain of where your product outstrips theirs, and you can discover your unique selling points more easily. If you believe in your product and are confident of its merits, potential guests will sense this, and be more inclined to choose to stay at your hotel. For more information on Guestline's integration with GuestRevu (our review collection and online reputation management partner), please email sales@guestline.com.